Double Fine Productions was formed when Tim Schafer left LucasArts in 2000, along with much of the Grim Fandango crew. Their first game, a platformer called Psychonauts, was announced at the 2002 E3, and was scheduled to be released by Microsoft in spring 2003. 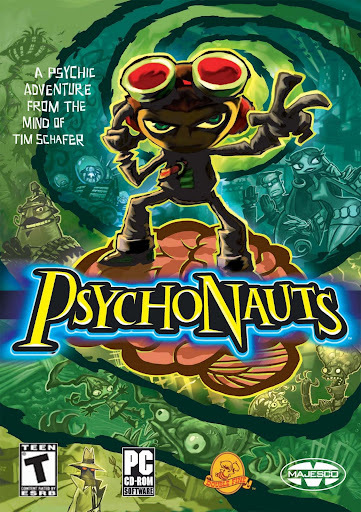 The game was eventually pushed to the holiday season of 2004, but Microsoft pulled out of the deal on March 30, 2004, and Psychonauts was left without a publisher. Development continued on Psychonauts with cash funded from Tim Schafer himself, until they finally found a new publisher. In August 2004, they finally found a new publisher in Majesco. Psychonauts was finally released for Xbox on April 19, 2005, for Windows on April 26, 2005, and for PlayStation 2 on June 21, 2005. The Xbox version was released via emulation for Xbox 360 through their Xbox Originals program on December 4, 2007. When the rights reverted back to Double Fine, Dracogen provided funding that allowed it to be released for MacOS on September 29, 2011 and on Linux on May 31, 2012. The PlayStation 2 version was released via emulation for PlayStation 3 through their PlayStation 2 Classics program on August 28, 2012. In Psychonauts, a young boy named Raz has psychic abilities. He wants to harness these abilities and become a psychonaut, which is a group of psychic heroes who use their powers to save the world. However, he can not get into the camp for psychic youngsters, since his dad disapproves of his psychic abilities. He eventually breaks into the camp, only to be informed that the counsellors called his dad to pick him up. Now Raz has to somehow become a Psychonaut before his dad picks him up at the end of the day.